Philadelphia and Warbling Vireos can be quite similar in appearance. This identification challenge is not necessarily straightforward, most esp. when dealing with these two species flitting about in green, leafy vegetation on a sunny day! Birds in these environments can reflect unusually bright greenish tones and can potentially mislead an observer to the actual distribution and depth of hue throughout. 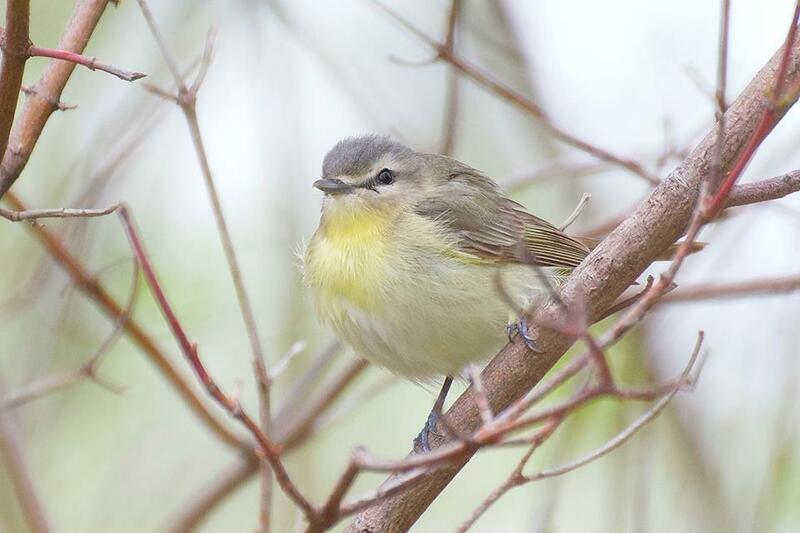 During fall, Eastern Warbling Vireos can be quite bright throughout the underparts, even brighter than some Philadelphia Vireos (Kaufman 1990). The approximations given in the Sibley and Nat Geo guides, such as the dark wedge to the loral area (Philadelphia) or the lack of this feature (Warbling) are merely averages. Warbling Vireo may sometimes show a dark wedge-like mark to the loral area, and some Philadelphia’s (especially first fall birds) can show a significantly reduced dark wedge. Other features, such as the shape and extent of the supercilium (eyebrow), or the presence/absence of a contrast between a greenish back and a grayish crown (typically, a Philadelphia Vireo trait) show quite a bit of variation. These secondary (or tertiary) field marks should be used with caution and in conjunction with the primary field marks noted below. Some solutions: the distribution of yellow as an identifying feature is consistent throughout. With Philadelphia Vireos, the yellowish tones are most intense in the throat and upper breast area. The intensity of yellow here is as high or higher than adjacent areas throughout the underparts. 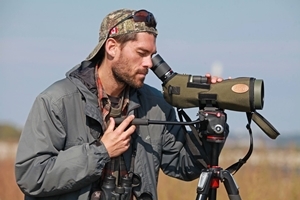 With Warbling Vireos, the opposite is true; the depth of yellowish tone is lowest to the throat and upper breast area and highest along the flanks and undertail. Differences in GISS (General Impression of Size and Shape) between the two species are also notable. 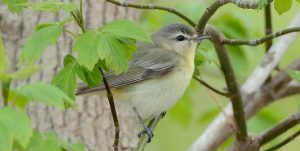 With Philadelphia Vireo, the combination of slightly shorter bill, slightly more rounded head shape, marginally more pot-bellied, and somewhat shorter-tailed than Warbling lends the expression of a smaller and more portly vireo. Spend some time studying these two vireos while they coincide in eastern and southern ON from the third week of August to early September, and you too will see the differences to their build. Figure 1: An example of a fall Warbling Vireo showing “typical” coloration throughout its underparts (left; photo taken at Britannia C.A., mid-August, courtesy of Norbert Haché) and a relatively drab fall Philadelphia (right; photo taken at Britannia C.A. mid-September 2015, photographed by the author). This particular Warbling has a high-contrast face pattern and dark loral wedge but lacks the bluish-gray blush to the crown, as is typically seen on even the drabbest examples of Philadelphia Vireo. Note the distribution, depth and concentration of yellow to the underparts of both these birds. Figure 2: At left, Philadelphia Vireo, photographed by Gillian Mastromatteo in Ottawa, early September 2014. At right, Warbling Vireo photographed by David Baird in Tillsonburg, mid-August 2015. Figure 3: An example of autumn plumage variation in Philadelphia Vireos. Few birders would question the identity of the bird at left; however, the identification of the bird at right could be cause for concern esp. deep in the tangles! As always, the distribution of yellowish tone to the underparts is a consistent and primary identification indicator. The overall GISS is tell-tale and provides an immediate impression with practice. Note the rounded, pot-bellied build of the bird at right. Many thanks to Gillian Mastromatteo, Owen Strickland, Tracie Kovener, Norbert Haché, and David Baird for the use of their superb photos. Their photos greatly enhanced the educational value of this article. Sibley, D. A. 2014. The Sibley Guide to Birds. 2nd ed. New York: Alfred A. Knopf.